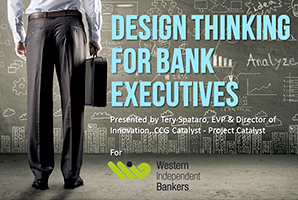 Summary from webinar Design Thinking for Bank Executives presented by Tery Spataro for Western Independent Bankers, February 7, 2017. There’s a lot of discussion on the use of design thinking for the bank’s business strategy. Much of the discussion is whether the utilization will prove to be useful or a waste of time. Before diving into the pros and cons of design thinking for the bank’s business strategy, let’s define what design thinking is and acknowledge past usage. Design thinking didn’t just pop up in the 21st Century the origins can be traced back to Thomas Edison. Edison in search for better illumination to improve the human condition, understood that failure is the opportunity to success. He developed countless prototypes for the light bulb until he produced a model that suited the needs of the user. What does this have to do with banking? Banks are at an important industry juncture: fintechs have a competitive edge with little regulation and bureaucracy to impede the way, can come up with new ideas to need consumer needs, to take to market rather quickly, fail fast, learn and adjust. Design thinking provides banks with a method for rapid discovery, investigation, customer empathy, evaluation, and testing. Design thinking is a protocol for solving problems and discovering new opportunities. Identifying the problem is the main progression to design thinking, and the problem is relative to resolving a customer pain point, understanding needs and improving the relationship. Banks are in the business of solving real human problems, which revolve around lending, transfer, savings and deposit of money. The interesting thing for banks, is the money procedures are altering because of technological change. Consumers and customers are looking for new accessible forms of lending, transfer, savings and deposit. AND they are not thinking about the functional aspects of bank’s products, but they are considering the benefits of products to their life situation. Design Thinking is the practice that banks should use to explore and uncover new opportunities to satisfy the needs of their customers and consumers. Consider these questions: When should design thinking be used? Why use design thinking? Design Thinking is used to differentiate, respond to trends and customer behavior. The use of design thinking gives a competitive advantage and aids in transformation, that will impact the bottom-line and drive business growth. Involve key stakeholders – includes leadership that is comprised of creative and analytical people who are divergent and convergent thinkers. Combine analytical systems thinking and embrace creativity, could be complex, try not to get caught up in believing this as daunting. Design thinking is effective for banks because it helps to shake things up and open minds to problems solving, exploration of opportunities that can transform and change the business of banks, and helps to reshape the bank’s culture. Using my out-of-the-box way of thinking, I revised the legendary design thinking approach to a helpful method that a bank executive can easily use, benefit from and exploit. I modified the context for banking so that bank executives could discover problems that need to be solved for bank customers, products and services provided, or design thinking can be used for internal exploration such as a specified business unit that needs transformation, or to determine if a partner is a good M&A fit. Empathize to understand the condition of your customer [bank to business customer, or bank to consumer], internal group or area that needs to be transformed and/or assessment of a partner. Document you findings. Using the research tool such as observation. Most importantly you are gathering both the rational and emotional aspects of the subject you are studying. Define take the findings you gathered and turning the findings into problems that need to be solved. Ideate this is where the fun begins! Present the findings by brainstorming on the thoughts and developing a framework. Prototype could be in the form of a mapping, systems blueprint, white paper, think-aloud (paper prototype), a wall of post-it notes– the prototype needs have a physical structure to gather a reaction. Test create the opportunity to learn – fail and adjust. The world is evolving quickly, to meet the needs of the nascent bank customer, banks will need to dig-in and try-out a new and novel approach to problem-solving. If you would like to give Design Thinking a try with your bank, CCG Catalyst – Project Catalyst will be happy to help facilitate your Design Thinking exercises. The webinar I gave for Western Independent Bankers, Design Thinking for Banks Executives can be accessed by clicking this link.